In this April 21, 2013, file photo, Maria Butina speaks to a crowd during a rally in support of legalizing the possession of handguns in Moscow, Russia. 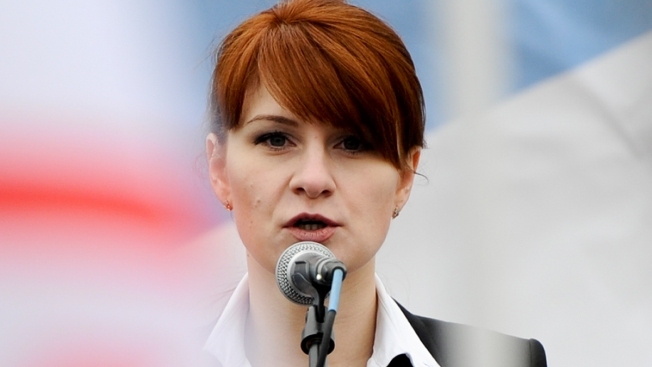 Russian operative Maria Butina, who is accused of infiltrating politically powerful U.S. organizations, including the National Rifle Association, in an effort to push Moscow's agenda, pleaded guilty Thursday to a conspiracy count, NBC News reported. Butina has agreed to cooperate with federal prosecutors and pleaded guilty in a Washington, D.C., courtroom to one count of conspiracy to violate the law governing foreign agents operating in the United States. The felony carries a five-year prison term, but the estimated sentencing guideline range is from zero to six months in prison. Butina was arrested in July and has been held without bail and could face deportation after serving any prison sentence. She had been in the U.S. on a student visa and Judge Tanya Chutkan on Thursday that Butina could face supervised release if she stays in the country. Thursday's guilty plea means she is admitting to conspiring with an unnamed American to act at the direction of a Russian official "to establish unofficial lines of communication with Americans having power and influence over U.S. politics … for the benefit of the Russian Federation," according to a plea agreement.